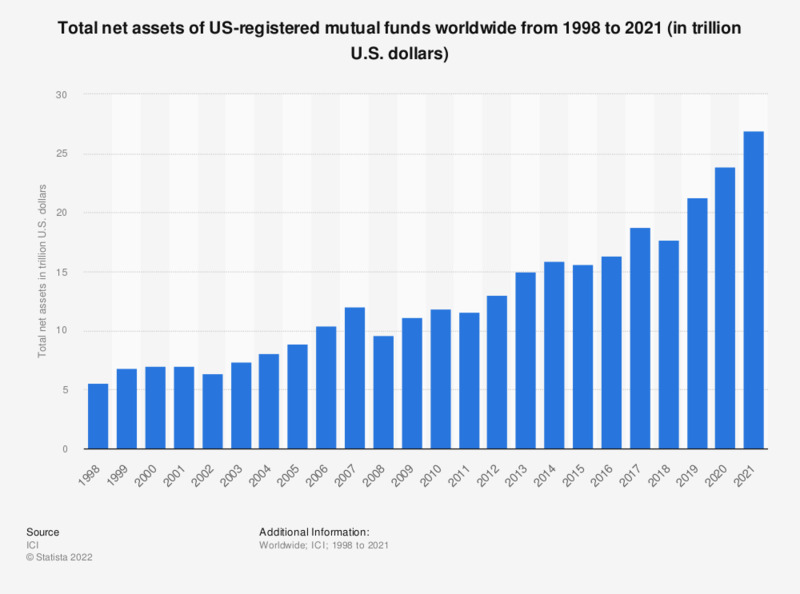 The statistic presents the total net assets of US-registered mutual funds worldwide from 1998 to 2017. It was found that the total global net assets of mutual funds registered in the United States amounted to approximately 18.75 trillion U.S. dollars in 2017. Mutual funds are investment funds in which the capital is pooled from a number of different investors and then used to buy securities such as stocks, bonds or money market instruments. Although investing in mutual funds, rather than direct investment in individual securities, still presents a certain degree of risk, it has become more and more common practice around the world. One of the biggest advantages of this type of investment is the fact that the fund assets are managed by professionals, who aim to eliminate some of the risk involved in investing in individual stocks and bonds through diversification of assets. As of 2016, there were more than nine thousand mutual funds domiciled in the United States. There are four main types of mutual funds, categorized by the nature of their principal investments, namely: stock or equity funds (whether domestic or international), bond or fixed income funds, money market funds and hybrid funds. In 2016, domestic equity funds were the most popular category in the United States, representing 42 percent of all mutual fund and ETF assets. Mutual fund data do not include mutual funds that invest primarily in other mutual funds.